A weather app designed just for photographers. — The sun is shining, bring a fill flash! Never get your camera wet again with hyperlocal precipitation alerts. Always know when the sky will be beautiful at that magical hour! See upcoming weather faster than ever with a unique colorized timeline. Fotocast is the only weather app designed just for photographers, by photographers. It also works well for outdoor videographers! There are a lot of great weather apps out there for smartphones and tablets. At Photographer’s Arsenal, our mission was to create a weather app designed just for outdoor photographers, with features useful to photographers that other weather apps lack. … packed with tools and features for outdoor photographers! We use hyperlocal weather data from several weather services to give you the most accurate forecast possible. See helpful photography suggestions and tips based on the current weather. 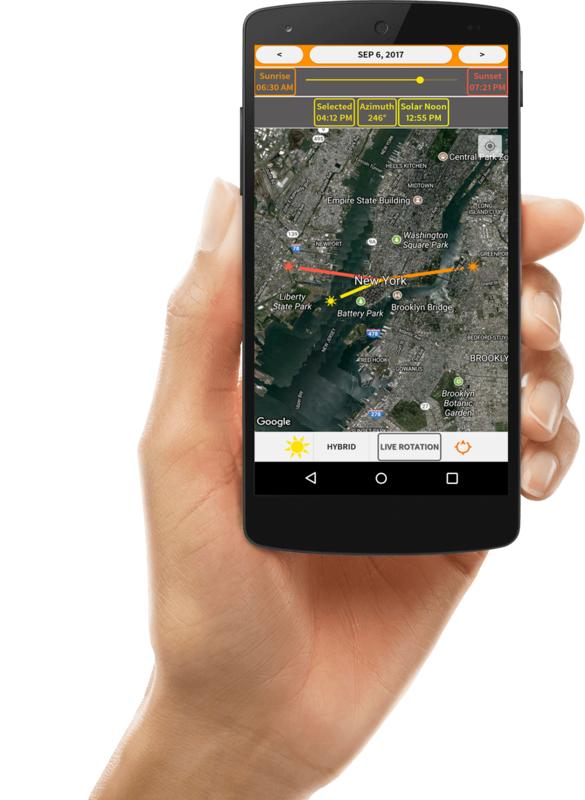 Automatically get camera setting recommendations based on the “Sunny 16” rule for your current weather conditions. Powered by SunsetWx, get a quality prediction for today’s sunrise or sunset. Know if the sky will be beautiful at that magic hour before you even leave the house! See the times for all of the important natural light phases for any date and location. First light, blue hour, golden hour, sunrise, high noon, sunset, nightfall, and more! See amazing photos from other photographers based on weather conditions for some quick inspiration! This handy tool automatically shows relevant photos based on your photographer type and current weather conditions. Always know what direction the Sun or Moon will be in at time, for any place! Save all of your camera equipment and gear into a database, and even configure what weather conditions you need each item for! Log your photo session distance traveled while on the go so you can save it to your computer later for book-keeping/accounting purposes. Save as many locations as you want in Fotocast, and quickly switch between them. *Minutely forecast currently only available in USA, Canada, and United Kingdom. More locations coming soon. Many weather apps lack cloud height information, but for outdoor photographers we understand how important this can be! 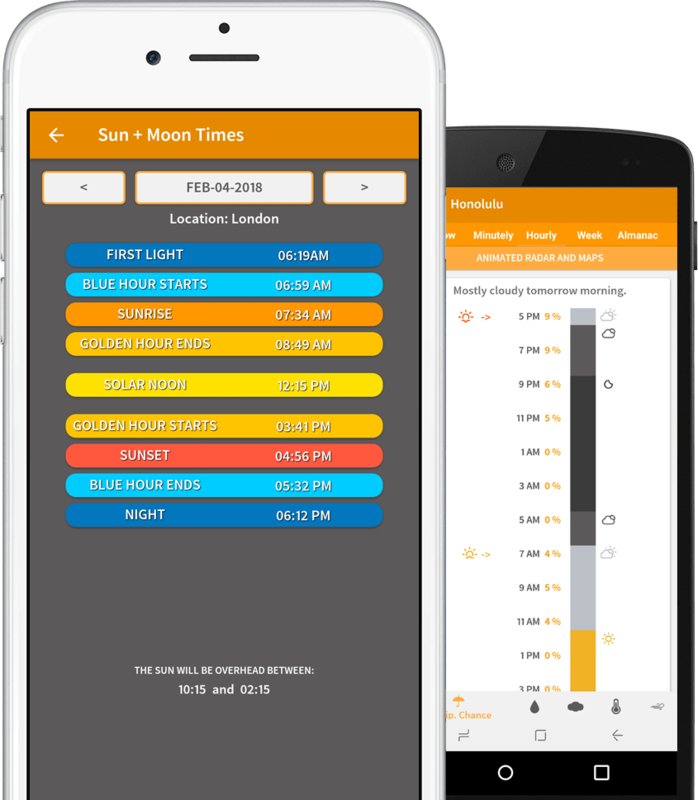 Get an automatic notification every night at a time you can set, of the next day’s weather. *Note: Not supported in all areas. Currently only supported in countries who have an online national alert system. No weather app would be complete without weather maps and animated radar! Fotocast has a lot of maps… even a light pollution map for night time photographers. A handy, large, contrasty digital clock. Take a photo of the time when shooting with multiple cameras to sync capture time in post processing software. Fotocast also has a built-in compass! See weather from any day in the past – and automatically average out past weather conditions to predict the future! Fully customize the color, look, and feel of Fotocast. We are always adding new features and tools based on user feedback. with fully customizable weather notifications! John wanted to take some beautiful photos of a pond on the other side of town, but he wanted to get shots when there was no wind and the pond looked like a mirror. The problem? He lives in a very windy city. The solution? 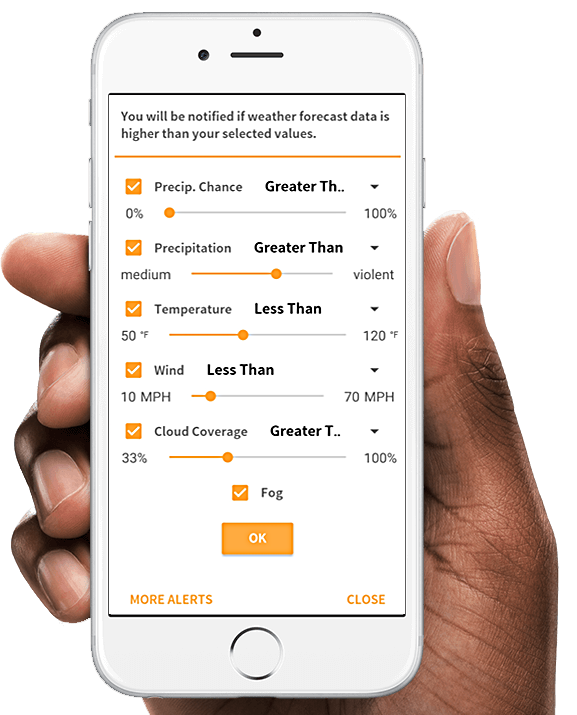 With Fotocast, you can configure custom weather notifications for just about any type of weather condition imaginable, for any location or multiple locations. Want to know when there’s fog at night so you can go out and get some insanely creative shots? We’ve got you covered. Want to know when the clouds are just right? Fotocast can do that. Are you an extreme weather photographer and want to know when there is a torrential downpour? Yeah, Fotocast can even do that. with the Sun + Moon direction tool! 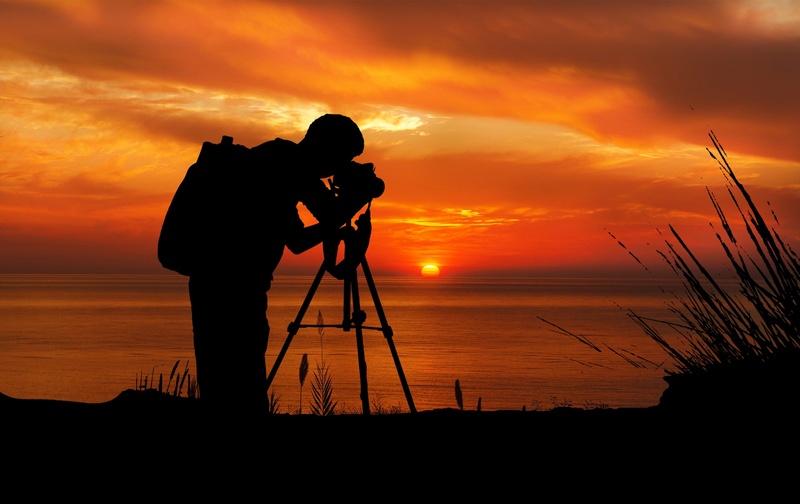 Planning an afternoon photo session with your clients who’ve picked their favorite location for sunset photos? Want to know what direction the Sun will be setting? Now you can. Maybe you want to know which side of a lake the Sun will be setting on a lake you’ve never been to. Maybe you want to know if that old barn your clients have on their property will be front-lit or back-lit at 7:32pm. With Fotocast, you can see what direction the Sun or Moon will be for any location, at any time, on any date. Program your upcoming photo sessions into Fotocast, and get alerted when rain or heavy winds are in the forecast for that location, date, and time. Weather forecasts can change. Never worry about having to check the weather in the weeks and days leading up to your scheduled photo sessions again! Fotoscore™ is an on-screen scoring system that tells you when weather conditions are perfect (or not so perfect) to take photos outdoors for your photographer type. The scoring system goes from 0 to 10, where 10 means perfect conditions outside and 0 are the worst conditions possible. 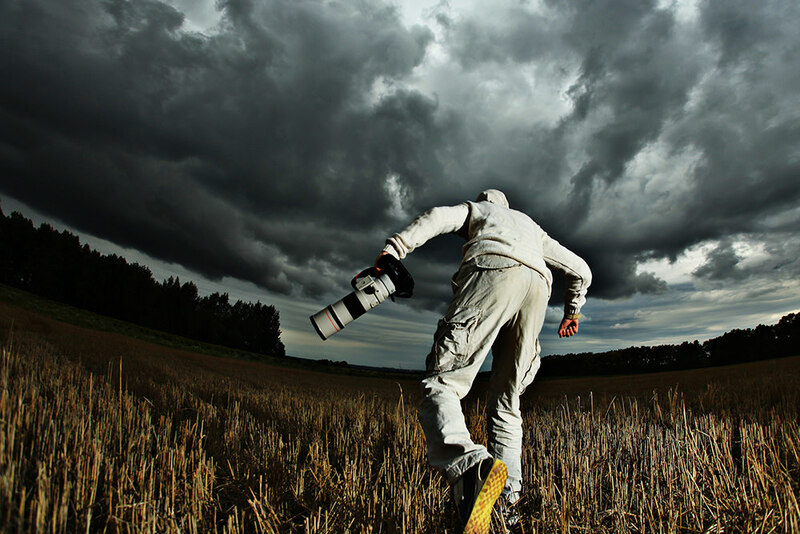 We’ve polled more than 5,000 photographers of various specialties to understand what weather conditions are most favorable to shoot in. With Fotoscore™ you no longer have to look at the complete weather forecast to know if you should head outside and take photos! If you have an idea for a new tool or feature you would like to see in Fotocast, contact us at any time and we will add it to the app as soon as we can! 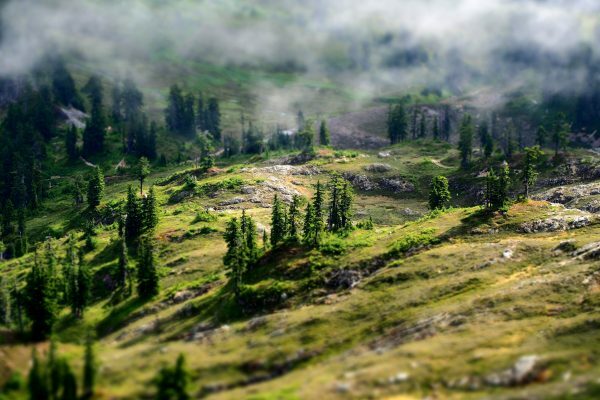 We donate a portion of the proceeds from this app to the Sierra Club Foundation, a charity focused on keeping the Earth a beautiful place for all outdoor photographers. Our first donation will be made in early 2019 based on 2018 revenue. Contact us after March 20th 2019 for a copy of the donation form and receipt. 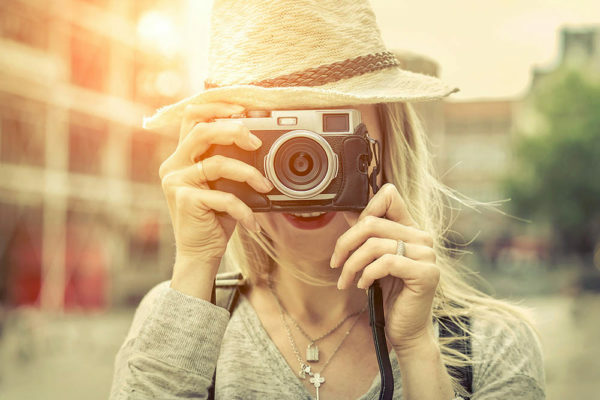 Take your photography to the next level today, with Fotocast! © Copyright 2018 Dunbar Technology, LLC - All Rights Reserved. Fotocast and Photographer's Arsenal are registered brands and trade names of Dunbar Technology, LLC.